On my last school day, one day before leaving Fukuoka, I planned to visit the Neko Cafe Keurig 猫カフェ キューリグ, which my Sensei recommended me. The cat cafe was very near from Nishitetsufukuoka station. The price is 1’000 Yen (~8 USD) for one hour entertainment with the cats including one beverage. The location was very peaceful and the view was nice too. They had many different cats, even a unique one, a white cat, which had two different eye colors! When you are in Japan and like cats as I do, you should check out a Neko Cafe ^_^! 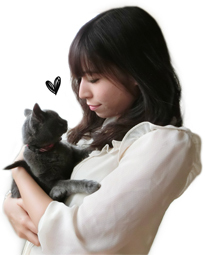 4F – Neko Cafe Keurig The Loft a catalogue with personal data about the cats chilling with cats ^_^ this one just jumped on me >w< cuddle time, nyaaa!! awww, sleepy tigers~ neko selfie xD OMG, those eyes! Isn’t he pretty? One eye was blue and the other one was green! I’ve never been to Japan before, but the cafe looks so good!